A smoke detector is an essential component of your home’s safety equipment, and having at least one smoke detector means that your surroundings are safer. 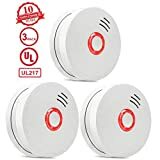 That’s great, but you just need to take the necessary steps to keep your smoke detector in proper working order and by that I don’t necessarily mean doings a whole home smoke detector replacement, but rather checking and replacing their batteries. Generally your smoke detector will let you know if the battery is low. If your smoke detector keeps chirping or there is a blinking red light you might need to change the battery. The smoke detector red light could also indicate that your system is over 10 years old and needs to be replaced. A hard wired smoke detector with a red blinking light could indicate that there’s a problem with the wire connection. If you’re not sure it might be a good idea to do a quick search on the internet to find out. One key activity involves changing the battery in the detector. Here are the simple steps you should take to do that. You first need to find out what type of battery is needed in your smoke detector. Many detectors require a 9-volt battery. Look in the user manual and on the exterior of the detector to see if it specifies a particular brand or model of battery. Only use a brand-new battery that has never been used. Make sure the current date is before the expiration date specified on the battery. 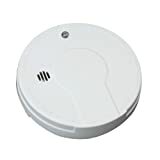 If you have a wired smoke detector, which is one that is connected to your home’s electricity, carefully disconnect the electrical plug going to the detector. Whether you have a wired or nonwired detector, the next step is to carefully twist the exterior casing until it slides off the rest of the unit. Place that piece in a safe place, or let it gently dangle if it does not fully detach. By keeping fresh batteries in your smoke detector, you will be better assuring the safety of everyone in your home. In the process you’ll increase your peace of mind. The next step in changing the smoke detector battery is to remove the old battery by gently pulling it out of the battery area of the smoke detector. Then plug in the new battery at the same spot. If there is a dust or debris inside the smoke detector unit, this is a good time to carefully clean that with a soft dustcloth. Then replace the smoke detector exterior piece, and gently twist it back into place. If you have a wired smoke detector, reconnect the electrical power by plugging it back in. Make sure all is working well with the smoke detector by pressing the appropriate button on the exterior button of the smoke detector. The test button will likely be labeled as such and will have writing indicating how long you should press the button. If the test goes as it should, you are done with the task of replacing the battery. Typically changing your smoke detector’s battery is a straightforward process. Sometimes there can be glitches though. 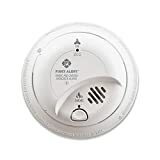 If you test the smoke detector after replacing the battery and the unit does not operate the way it should, check to make sure you connected the new battery properly. Also make sure you are using a battery that is not expired or in any way not working the way it should. If the smoke detector makes high-pitched “chirping” noises, that might mean the battery is not installed properly. It could also mean the smoke detector has reached the end of its typical life and needs to be replaced with a new one. Follow these steps for every smoke detector in your home. Do so at least once per year, but even better, make a note on your calendar or other prominent place to remind yourself to change smoke detector batteries every 6 months. Also, replace the battery whenever there is a “low battery” indicator on the detector. By keeping fresh batteries in your smoke detector, you will be better assuring the safety of everyone in your home. In the process, you’ll increase your peace of mind. So be sure to keep smoke detector battery replacement on your home security checklist. Interested in monitored home security? Get a free quote from Protect America by contacting us.